This hotel is right in the heart of Patong. It is only 5 mins walk to Bangla Road and the beach. Stayed 2 nights 3/13-3/14, room is nice and clean, towels smells great, love the roof-top pool looking out to the beach, it is nice at night when the lights are lit up. A little expensive, but you are central to everything! Patong Beach was dirty, so we didn’t bother to go in the water, but decided to go see Big Budhha Temple and Wat Chaolong Temple, at night we stroll along Bangla Road, that’s where the nightlife party people showed up, and we hired a tuk tuk to go around the city. Our last night, we sat at Murphy’s Pub to have a beer and listened to their local band. They sang all the songs that we requested. Overall, nice hotel, close to beach, Bangla Road, but Phuket is not the place for me, I would prefer to stay in Phi Phi Island and Krabi. Not the cheapiest hotel in Patong, but you get what you pay for. Staff very service minded, clean room. Breakfast not so large but tasted good. Rooms are big but beds (2*120cm) are very huge so if you are two people it's hard to walk around in the room. GM James told me that they shall change to smaller beds. GREAT! Rooms very soundproofed, couldn't hear anything from Bangla road or from any other rooms. Hard to find a hotel in Patong which is situated better than Hotel Clover. Close to the beach (5 min), close to Bangla road (5 min). Nice roof pool but small, must be there before lunch to get a sun chair. Price and beds is the reason why not full pot. The hotel was in a great location, close to the main hub. Good clean rooms although just enough for 2. Breakfast spread was amazing and it changes everyday. Rooftop pool and bar a great place to relax after at the beach the whole day. Great sunset views. My room was quiet even though it is in a busy area. This hotel is fantastic. I stayed here for a week whilst in Patong. The rooms were modern and clean, although not massive, big enough for what you need. Any little issues I had were immediately addressed and rectified by staff. Upon check in I was given an invitation to a cocktail party on the roof top which included free cocktails, finger foods and a cooking demonstration. This was a nice little addition to the stay. The hotel is conveniently located only a block away from Patong Beach and Bangla Road. There is plenty to see and do in walking distance from this hotel and should you need to catch a taxi somewhere, the staff at the tourist desk are more than happy to help with that. The roof top pool has views of the ocean and is a perfect place to relax through the day and enjoy a drink or two by the pool. All of the staff were friendly. Will definitely stay here again when ever I am back in Patong and strongly recommend to anyone thinking of staying in Patong. This was my last stay on a 3 week Thailand trip. My mate and I needed in Phuket. The overall area is very busy with tourist from all over. Great restaurant and nice beach. The hotel was very nice. Modern, comfortable and well equipped. The staff was nice and friendly. I highly recommend if you want to stay in the mix of all the attractions. This is the former surf hotel now taken over by the Clover Group and given a complete makeover. The hotel has its own rooftop pool and cafe overlooking Patong Beach, the infinity type pool is a great way to cool off during the day and there is also a fully equipped gym on the same level. My room was large and light and very quiet considering the hotel is only 5 minutes from Bangla road. A large bathroom and a king bed that was easy to sleep on ( not too hard). The cafe downstairs has breakfast lunch and dinner the cost of breakfast was only 350bht and all the food was fresh with the hot selection changed every day. Over the years I have stayed at over 10 hotels in Patong and this would be the best I certainly will be staying here again as well as trying out other Clover hotels in Asia. Central to all you need in Patong and a very welcome sanctuary from the hustle & bustle. The staff are all very helpful and respectful of their guests, and clearly work hard to maintain the high standard of the hotel. Very new & modern accommodation with good guest amenities, including personal touches such as umbrellas, flip flops & a flashlight, very thoughtful ! The rooftop pool & bar is so relaxing and a perfect spot for watching the sunset. Would definitely return to Hotel Clover. Patong is an interesting place and maybe I am starting to get too old for the bustle of Bangla Road but nearby is the Hotel Clover which provides a perfect oasis for to provide an escape from the nightlife. Close enough to the beach and nightlife but providing an excellent retreat when required this place is ideal. The rooms were clean and well looked after, simple balcony (all we needed really) as well as a rooftop pool and bar. The reception staff were kind, understanding and helpful throughout. The price was competitive also and so if you wish to explore Patong and nearby I would recommend this as a cost effective option. Quite new hotel at a central location in Patong. Walking distance to the beach and to all attractions. Very clean room although a little small in size. Not recommend for families. A couple or solo travels should prefer. Staff is not experienced but try to do their best. Roof has a small pool but has a great view of sunset. Hotel Clover Patong Phuket places you next to Patong Beach and within a 5-minute walk of other popular sights like Bangla Road. This 213-room, 4-star hotel welcomes guests with conveniences like an outdoor pool, free in-room WiFi, and free self parking. Sit down for a leisurely bite to eat at the onsite restaurant, or enjoy a drink at the bar/lounge. Savor a meal from the privacy of your room with room service, or get a pick-me-up at the coffee shop/café. For your convenience, a buffet breakfast is served for a fee each morning from 6:30 AM to 10:30 AM. Guests can expect to find free WiFi and 43-inch a TV with cable channels. The bathroom offers hair dryers, free toiletries, and bathrobes. Other standard amenities include a refrigerator, a minibar, and a coffee maker. 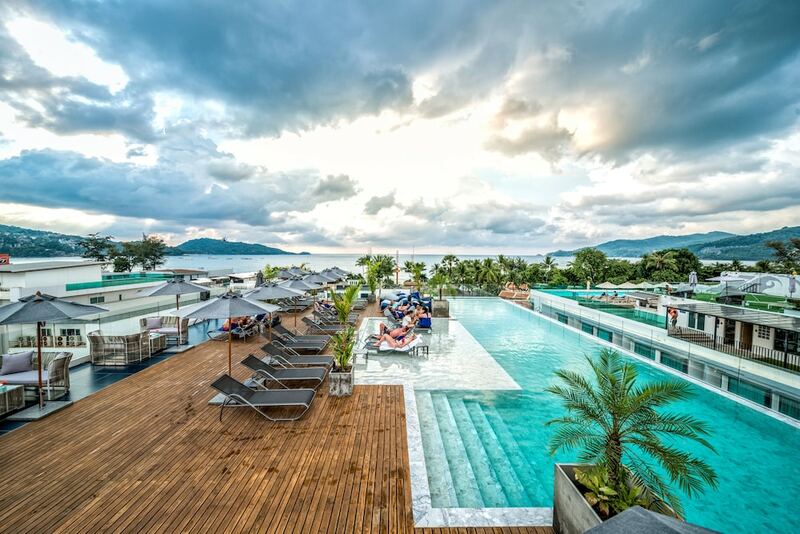 Hotel Clover Patong Phuket features an outdoor pool, a children's pool, and a fitness center. There's free parking and an area shuttle for a fee. The 24-hour front desk has staff standing by to help with luggage storage, dry cleaning/laundry, and tours or tickets. Other amenities at this beach hotel include free WiFi in public areas, a meeting room, and a business center. Onsite venue - Restaurant specializing in local and international cuisine. Open daily for breakfast, lunch, and dinner. Kid's menu available. The hotel has an outdoor pool and a children's pool. Other recreation options include a fitness center. The preferred airport is Phuket (HKT-Phuket Intl. ): 32-min drive, 21.4 mi/34.4 km.